Alone, tired and sleeping in a little hut in the Outpost Settlement, an unlikely hero (or poor sap…your choice) awakes and embarks on an unforgettable journey to recover a stolen and powerful artifact known as the Crown of Kings. Thus begins the first book of Steve Jackson’s classic Sorcery! 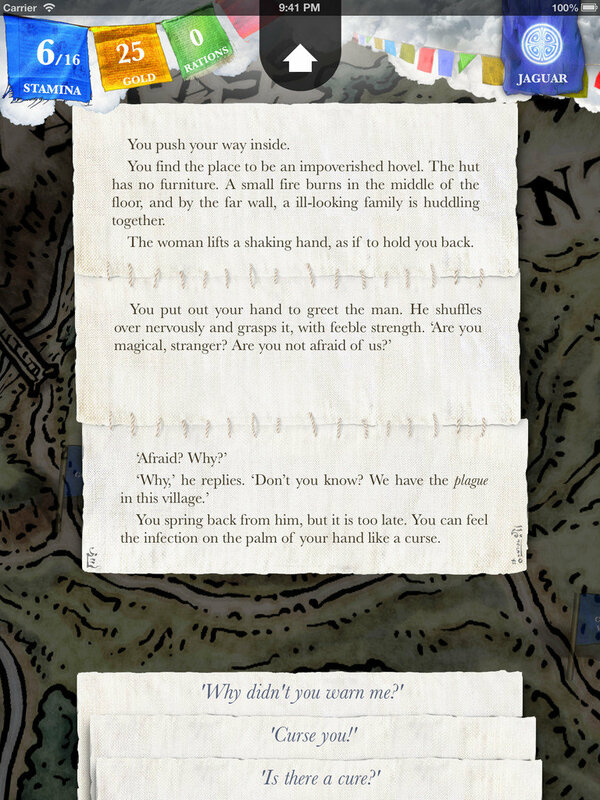 gamebook series, expertly transformed into an interactive adventure for your iOS device by the talented team at inkle. Never having read the original series (I think they were more popular in Jackson’s native England) I really wasn’t sure what to expect. Though during my sneak peek at PAX East earlier this year, I was immediately captivated by Sorcery’s beauty and combat and spell mechanics, but I didn’t really get to dive into the story itself, which plays out on a gorgeously illustrated and sprawling 3D topographical map. The map while not only beautiful to look at, does a nice job of helping you keep your bearings while navigating this vast and unfamiliar land. Some may look at Sorcery! and incorrectly assume it to be a fairly static, reading experience, but there is a lot going on and it is much, much more than just another forking adventure story. 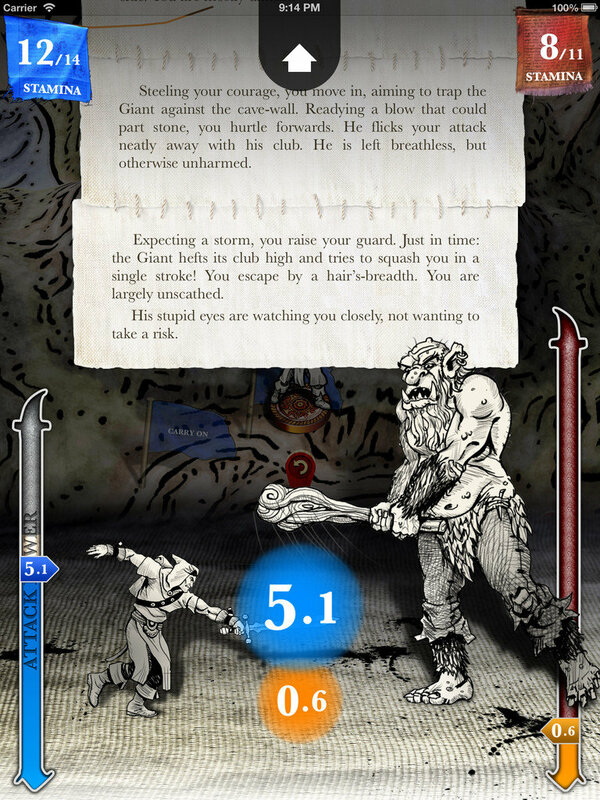 Unlike most digital gamebooks, Sorcery’s narrative is written (and re-written) on the fly based on the choices you make and all of your past experiences and decisions well. Though there are obviously a finite number of possibilities, it gives the story arc a more personal feel, tailoring it to your play-style, allowing for not only a unique experience for each reader, but increased replayability as well. To navigate the game’s map, you simply drag a line from your character to the flag marking your desired destination. Sometimes there will be a fork in the road, leaving it up to you to select a path. Every time you make a map decision, a check point is marked and you can rewind back to any of your previous check points should you die or just decide you want to make a different choice. The only thing lacking here is the ability to sync your progress across multiple devices. One way in which your personal decision tree (fighting style, whether or not you trust others or are more cautious and inquisitive) manifests itself within the digital gamebook is through your spirit animal, which changes as you make certain choices throughout your journey. Are you a Panther with a balanced heart or perhaps a Fox, who is always scheming? What does your animal say about you as a person? Your spirit guide can be called upon (prayed to) in times of need; when you require some assistance, healing, etc. Fortunately it is here too that Sorcery! takes a bit of a departure from the status quo. Short passages of text are elegantly presented with each being stitched to the previous one as the story is built and decisions are made. It is a somewhat subtle, but cool looking effect and one of those little touch of polish that makes this gamebook so rich. Not being much of a reader myself (I usually opt for audiobooks) the smaller digestible chunks make Sorcery! a pleasure to read and easy to pickup and play whenever I have a short (or long) slice of time. The ambient music and sound effects along with the high quality of writing do a fantastic job of setting the scene and really drawing you into this world. 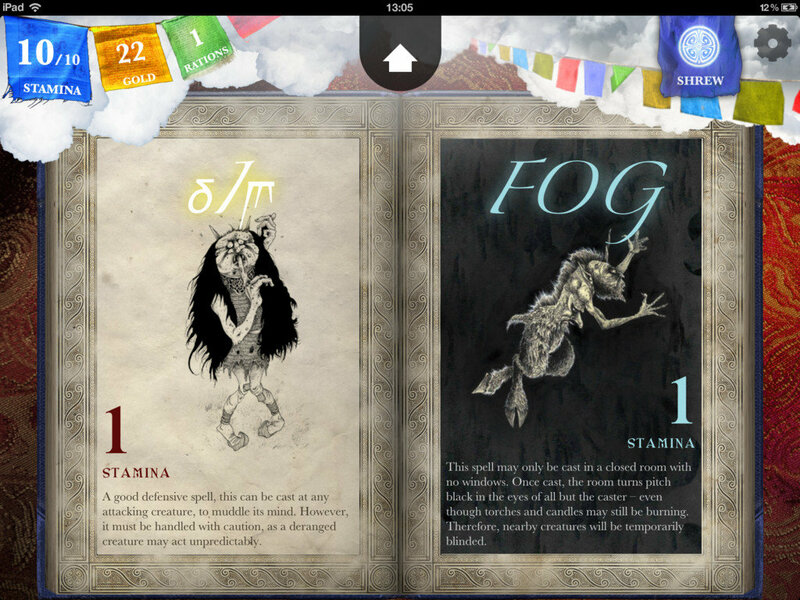 This app’s story is based only on The Shamutanti Hills, the first book in Jackson’s four-part Fighting Fantasy gamebook series. However, the folks at inkle have added at least 100% more content to the narrative to create more locations and forking paths to expand and extend the experience even more. Again, having never read the original, I couldn’t even begin to tell you which portions are from the original source material and which have been added, the quality of the writing felt consistent throughout. Unlike the perhaps more familiar “Choose Your Own Adventures”, gamebooks generally contain a combat element and your character has some related heath / power stats. In Sorcery! these stats consist of stamina, gold and rations. You carry around an inventory of items like food, weapons, ingredients and a spell book and need to make sure you manage your character’s health with food rations and take rests to restore stamina lost in battle. In the original (physical) Sorcery gamebooks, combat was handled with the typical rolling of dice, however, for inkle’s digital gamebook Jackson insisted that the team come up with something new…and innovate they did! Rather than relying solely on chance, the fighting mechanic in Sorcery! allows for much more strategy and player influence. It is a turn-based system in which you set the power of your attack (or just take a defensive stance to try to build back up energy). You have a limited supply of energy, so a strong attack on one turn means that your max power on future attacks will be greatly diminished, so you have to watch for written clues in the dialog and plan your attacks based on how powerful of a strike you think your combatant will wield. At the end of a battle, if you are unhappy with your performance (or lose), you can try again. Overall, this system makes for some really fun and more dynamic battles. Plus it helps that Jackson has come up with some really great enemies. It is called Sorcery! so there must be spells right? Yep! In fact, the game’s spell system is also quite unique. Spells are cast by forming special three-letter names that map to each spell. To cast a spell you just spell out its name. You will not always have all the letters you need to cast a particular spell and certain spells require that you have particular ingredients in your inventory. Properly timed spell-casting can mean the difference between life and death in battle and it is fun to experiment with them. My only complaint is that I wish it was a bit easier to access the spell book directly from the spell casting page, so I can more quickly look up details on a particular spell. 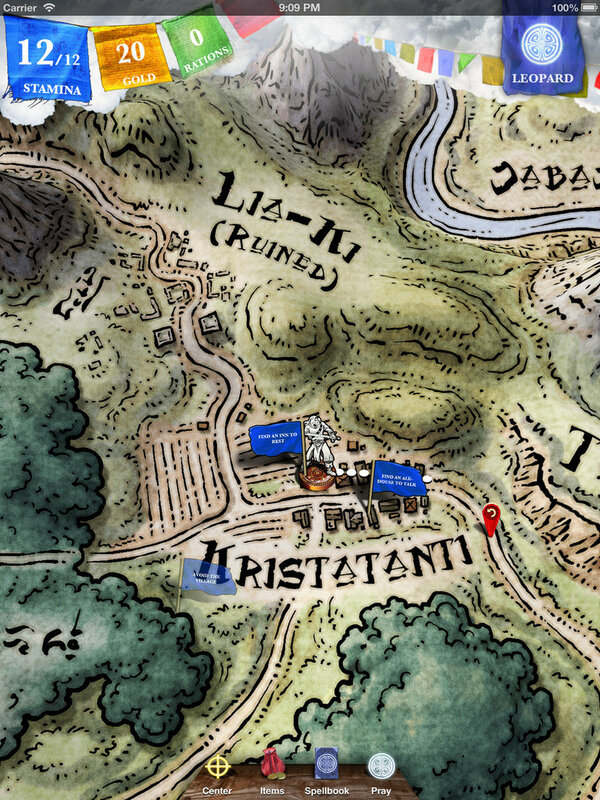 With Sorcery’s engrossing and well-written story, simple yet elegant interface and innovative combat and spell casting systems, inkle has set a new standard when it comes to digital gamebooks. The constantly forking and on-the-fly story-building give this create your own adventure loads of replay value. With so many possible narrative branches it seems like there is always plenty more for me to explore in this book while I wait for more of the series. As I said, I am not a ‘reader’, so if you can find a way to get me to read a lot of content AND find it so entertaining that I don’t want to put it down, then you are most certainly doing something right!